A Shepherd's Post: Good Friday: Do You Live Differently Now? "Before the feast of the Passover, Jesus knew that his hour had come to pass from this world to the Father. He loved his own in the world and he loved them to the end." Last night, at the Mass of the Lord's Supper, we reflected upon those words. This evening, we come to the foot of the Cross and we see these words actualized in their completion. We see that He loves us to the end. To His last ounce of strength, to his less breath of air, to his last drop of blood. He loves us to the end. Last week I heard the news report of a policeman in France named Arnaud Beltrame. When a terrorist had taken hostages, Arnaud Beltrame volunteered to take the place of the last hostage. When I heard that news report, I immediately thought, "Gee, that woman must feel the need to live her life in a completely different way now. She must feel that she owes it to this man who died in her place to live a life worthy of such a sacrifice. At the moment that I thought of it, I wasn't thinking on a theological level. I was just thinking merely on a human level. I'd imagine that if someone gave up their life for me, took my place, that I'd live the rest of my life in an entirely different way. Then, almost instantaneously it occurred to me: Someone has given up their life for me. So often, we say, "Jesus died for our sins." As true as it is, we can often say it in a kind of disinterested way. We say it as though it really didn't mean much for me personally. But the reality is that he died for MY sins. He died in MY place. I was the hostage. I was held in captivity to the powers of sin and death. And into that reality, Jesus entered in and took my place. His death is not the result of some nebulous notion of sinfulness. No, his death was for MY sins. For YOUR sins. You were held captive and were facing certain condemnation. Instead, Jesus offered himself. He loves us to the end. In fact, the very last thing Jesus did in his earthly mission was for us. St. John tells us that after announcing, "It is finished," Jesus bowed his head and "handed over the spirit." 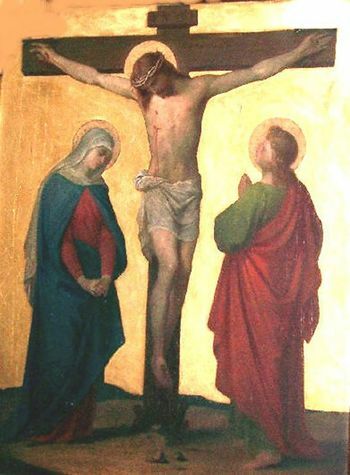 At the foot of the Cross was the Blessed Virgin Mary and St. John. There, they were the beginning of the Church. And upon them, Jesus handed over the spirit. He handed over his spirit. He breathed his last breath upon them, the spirit which enables the Church to live a new life. From the Cross, Christ hands on to us his spirit so that we can live a new life, a life marked by profound gratitude for what we have received. "If you love me, you will keep my commands." "As I have loved you, so you must love one another." "What I have done for you, so you must do." "Whoever wishes to be my disciple must take up his cross and follow me. " Tonight, we come to the foot of the Cross to say, "Thank you." To adore the Innocent One who came to save the guilty. We fall on our knees before Him in gratitude for rescuing us from the terror of sin and death. We come to beg Him to breathe upon us His spirit, a spirit of love, a spirit of total gift of self.